The SAA is proud to offer Dinner With 12 Tar Heels each semester. The premise of Dinner With 12 Tar Heels is based on one idea: to connect the Carolina family around the dinner table. Local alumni host a dinner ifor our current Carolina students. As the name suggests, the dinner is for a party of 12 Tar Heels. It sounds simple. One simple meal, however, can spark a lifelong connection. Alumni feel closer to the University, students feel closer to home and the Carolina tradition continues for years to come. These dinners are held throughout the fall and spring semesters each academic year. SAA members are notified of/invited to upcoming dinners via email. As a member of the Student Alumni Association, you have access to unique opportunities to ensure your Carolina experience is memorable. As part of the Carolina family, you now have the chance to connect with local UNC alumni through Dinner With 12 Tar Heels. The premise of the program is to bring GAA alumni and 12 student members together for an off-campus meal where a good time is guaranteed. Dress is casual. If you RSVP to attend a dinner, your host will be expecting you, and you should only cancel due to an emergency. All dinners are announced via SAA email updates, and you may RSVP using the provided email address. As a member of the UNC General Alumni Assocation and a part of the Carolina family, you now have the unique opportunity to enhance your lifelong connection to the University of North Carolina through its current students. The Dinner for 12 Tar Heels program is an initiative to bring 12 GAA alumni and student members together for an off-campus meal and mutually beneficial fellowship. We are looking for all alumni friends who would like to connect with current UNC students and who enjoy entertaining guests. Alumni hosts can choose almost any night throughout the academic year to welcome students into their home for dinner. If you’re interested in opening your home as an alumni dinner host, please contact Kylie Apple to view available dates. 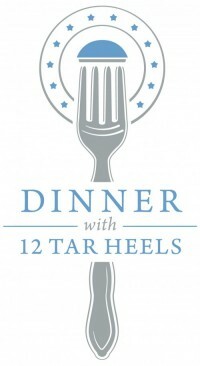 Interested in hosting a Dinner with 12 Tar Heels? Apply now.